An observation and commentary concerning the ‘awa ceremony conducted on June 17, 2017, as part of the homecoming of Hōkūle‘a. The following is offered as a result of observing what transpired during the homecoming activities of our Hōkūle‘a and to respond to inquiries made thereafter. Our purpose is to be an invaluable educational resource based on the life’s work of Mary Kawena Pūku‘i. who dedicated her life to the preservation and perpetuation of the Hawaiian culture and language, authoring/co-authoring over 50 books and scholarly papers concerning the Hawaiian culture, composing over 150 songs and chants, while also assisting many others in their work and leaving an incredible body of knowledge in the Bishop Museum archives for her people and future generations to know about their Hawaiian culture. As with other traditions, there are those who know this information and stay true to tradition, there are those who know but choose to ignore what has been preserved and create their own “tradition” and there are the many who don’t know but would like to. This information is offered to inform and educate those who want to learn these historic traditions, in the Hawaiian community as well as the community-at-large, and is given here with respect and aloha for the ways of our kūpuna. “KAVA IN HAWAII” by Margaret Titcomb appeared in The Journal of the Polynesian Society in 1948. The Foreword states, in part, “The material has been gathered from a wide variety of sources: observations of foreigners, early visitors and later residents, native material from chants and legends, revealing thought untouched by external influence, and later-day comments by Hawaiians in their newspapers and periodicals. Hawaiian sources have been searched by Mary Kawena Pukui. She has selected, translated and elucidated the material and has contributed from her own wide knowledge of early Hawaiian life as well as searching for information from other Hawaiians. Deep indebtedness for her share in making this record is herewith acknowledged.” Another key informant was Kawena Pūku‘i’s mother, Pa’ahana Wiggin, who was a ‘awa chewer in her youth. This is a comprehensive and in-depth work. Areas covered include: The Plant Source; Description of the Plant; Beverage; Taste; Effect; ‘Awa as Medicine; ‘Awa and Social Rank; ‘Awa in Religion and Sorcery; Communal Offerings; Sorcerers’ Practice; ‘Awa and the Gods; Utensils; Fibre Strainer; Gourd Strainer; Gourd Kanoa; Stone Kanoa; Wood Kanoa; Cups; Pounders; Pouring; Petina; ‘Awa After European Contact; Summary. 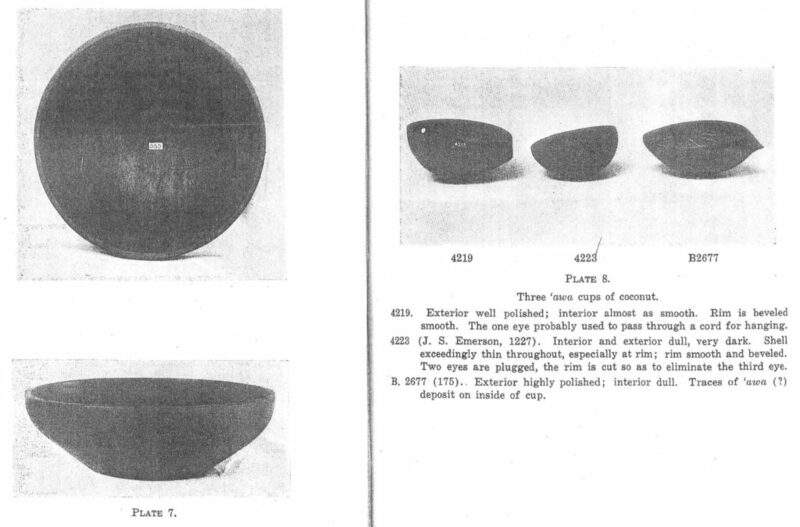 This 67 page paper also included pictures of a ‘awa plant, gourd strainer, hue wai, bowl kanoa, carved ‘awa bowls (here and from other museums), several ‘apu ‘awa and a wooden ‘awa pounder. Rather than copy this document in total, we will address areas that pertain to what was done by Kamehameha Schools that were not traditional practices. Please note that we take no joy in having to address what transpired, but to withhold the truth will only foster continued misrepresentation of our culture and kūpuna. There are no adequate words of praise for Hōkūle‘a, her creators, leaders, crews, accomplishments and the teachings of Mau. During his inspirational and heartfelt address, Nainoa mentioned his dad, Pinky, believed that there is nothing worse than a neglected and abused child. Although not nearly as bad, teaching our children distortions of their own culture is also unacceptable and all schools, especially Kamehameha, who we hold to a higher standard, have a duty, responsibility and obligation to teach about our Hawaiian culture as correctly and seriously, as any other subject. Incidentally, the majority of our Board are Kamehameha graduates. – First of all, wood kanoa were made from milo, kou or kamani. 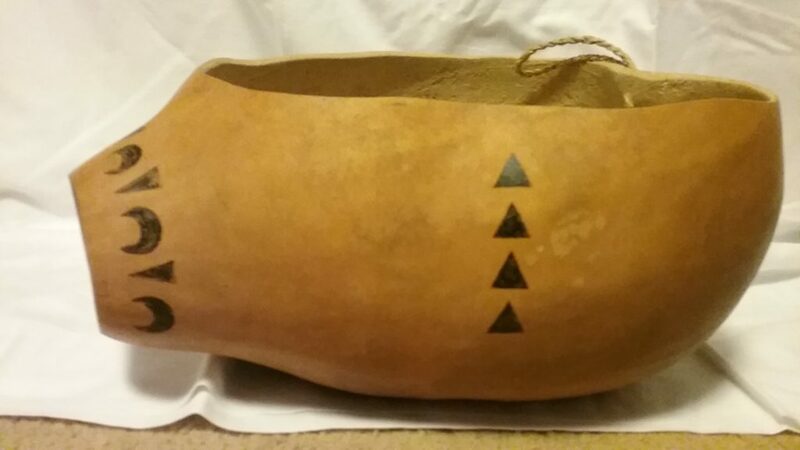 Ipu (gourds) were also used as kanoa. It appeared that the bowl used for the Hōkūle’a “ceremony” was monkey pod, an introduced wood that leaves a bitter taste in food or drink, like koa, and would never be used in this manner. 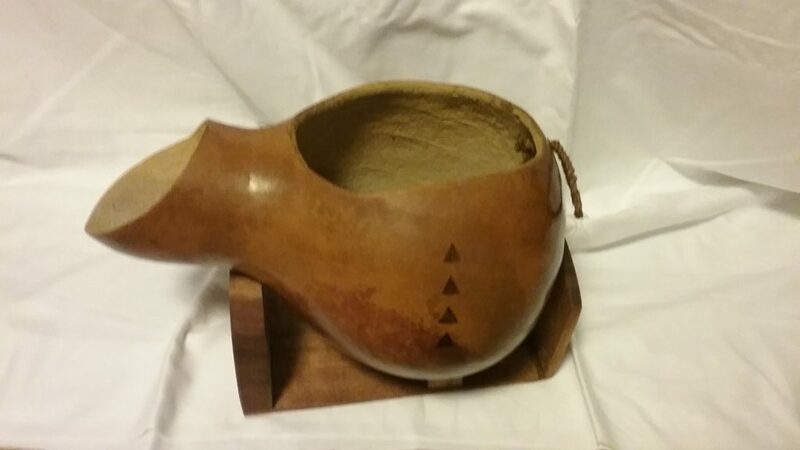 Wooden kanoa, depending on shape, “were provided with a rounded notch at one end, from which sthe ‘awa was poured into cups. At the opposite end, a hole was made for a cord to pass through, by which to hang the kanoal.” The “conductor” of the Hōkūle’a ceremony kept stirring the ‘awa with some kind of utensil and using that to pour into cups. We will explain why this was not proper serving later. – We had no way of knowing what variety of ‘awa was used that morning, but there are only three types of ‘awa that were used for ceremonies, mo’i, hiwa and papa. “Only the most common variety could be used by the commoner; the rarer kinds were reserved for the chiefs. For the gods and on ceremonial occasions the moi (royal), hiwa (black), and papa (recumbent) were used,..” It would be interesting to find out what variety of ‘awa was used that day. – The ‘ahu ‘awa (sedge used for straining) was used that morning for show only. because it was obvious the ‘awa was prepared earlier, probably from powdered ‘awa, so no straining was necessary. – There was never any such practice as sending someone, as part of a ceremony, to run out and feed ‘awa to a canoe, which was done in this ceremony. Quite the contrary, there was no unnecessary talking, movement or noise allowed during a ceremony. 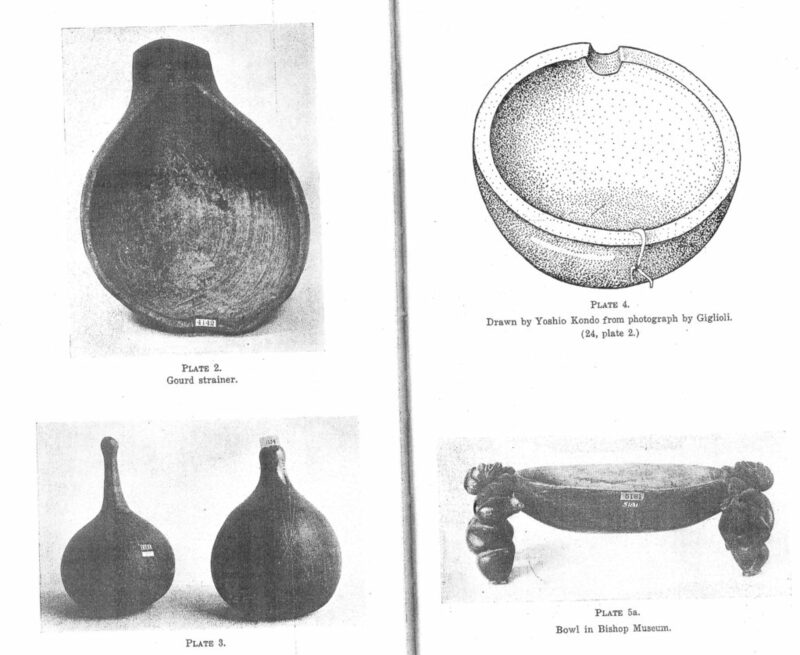 It is a well-documented and undisputed fact, that ipu (gourds), called hue wai or ipu wai, and NOT ‘ohe (bamboo) were used for the collecting, transporting, storing and pouring of water. Hue wai were further identified by shape, as hue wai ‘ihi (short neck), hue wai ‘ihi loa (long neck), hue wai pū’ali (constricted around the middle) and hue wai pueo (shaped like an hour glass). ‘Ohe was used that morning. The order of serving was important and depended on the circumstances. For social drinking, the highest ranking must be served first. If there were two equally high ranking chiefs, they would be served at the same time. However, ceremonial serving was different. Serving was by order of rank BUT the second highest ranking person was served first and down the line in order. Why? Because “the last cup, being the most potent because it contained the residue of ‘awa, was the one carrying the greatest honour and would go to the highest chief, who would therefore have to wait for his cup.” That is why one cup only, per participant, was prepared and why having more than that in the kanoa and constantly stirring it, as was done that day, would not allow for these factors to occur and is not the documented way of our kūpuna.. Most important is communing with the Higher Powers, ‘aumakua and ancestors and ‘awa was always shared with the spirit world. It appeared that only the servers and the conductor attempted this and, the honored particpants did not, which is understandable if they were not told what to do. “After prayer, the ‘awa drinker dips a finger into the ‘awa and snaps it upward, saying ‘This is yours, and this is mine’ Some people did it differently. This flipping of a few drops of ‘awa to the gpds may seem a small offering. According to Kawena Pūku’i, offerings of every sort made to the gods were symbolic. The expression was “The shadow (or essence) is yours, the substance ours.” (Ke aka ka ‘oukou, ka ‘i’o ka makou. )” (Other examples were cited as being from Mrs. Pūku’i). To ignore this was never done, as it would be an insult and affront to those Higher Powers and ancestors that were called, and certainly cause punishment to the offenders. Besides, ceremonies were held for a reason, asking for long life, inspiration, blessing an occasion, protection from enemies, etc., so to invite those Higher Powers and make a request while denying them their favorite drink, does not fit with basic Hawaiian thoughts, beliefs and values. The person conducting the ceremony seemed far removed from the participants, who usually sit in a circle. It was odd that the servers gathered in front of the “conductor” who served them ‘awa after the actual honored participants, and then served himself. If the conductor understood the significance of the serving order, by serving himself last, he declared himself the highest ranking person there. Intentional or not? It is well documented that, in Hawai’i, everyone held their own filled ‘apu ‘awa and drank together, not served one by one with ‘awa being consumed individually, as is done in other areas of Polynesia and as was done in the Hōkūle’a ceremony. Also well documented are the steps taken when drinking ‘awa. Once the ‘awa is shared with those in spirit, it is consumed, followed immediately with the drinking of wai (water) to rinse the mouth, immediately followed by consuming a bit of food, called pūpū, like mai’a (banana) or ko (sugar cane) or other food to take away the bitter taste of ‘awa. Sometimes, instead of plain water, aumiki, a mixture of water and noni, was taken after the consumption of ‘awa. “Whatever the taste, it was not one to hold in the mouth and linger over. 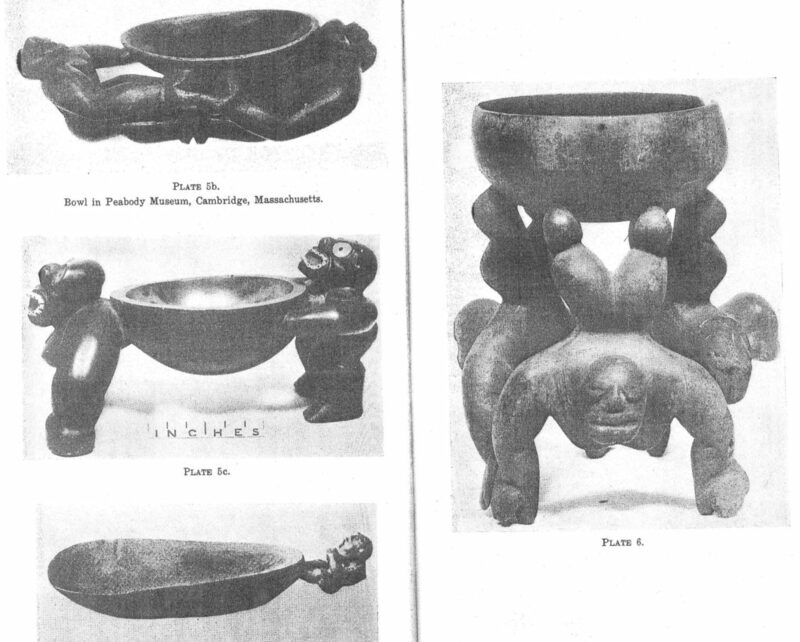 Water was always at hand to drink or use as a mouth rinse, and then a morsel of food, called pūpū, was eaten This might be any of good flavour – fish, bananas, cooked greens.” “Umi picked up the ‘awa cup and held it for Kiha-a-Piilani to drink from, gave him some water, a banana and sweet sugar cane to take away the bitterness of the ‘awa.” This was always done by Hawaiians, but was not done that day. All the missing elements indicated not a true ceremony, but a “show,” like some pageant created to entertain an audience. We are not saying that was the intent, but it appeared to be so. Ceremonies are serious business. The wrong words spoken, a mistake in procedure, an accidental affront, would bring dire consequences, including death, in days of old. A ceremony is performed for a purpose with all participants understanding why they are in attendance, what they desire to accomplish and how that will be done. Food for thought: If you attend church, would you walk up to the priest, father, reverend etc. and decide to conduct the service, not knowing anything about the proper protocols, having no training or understanding of the tenets of the church? Are we honoring our ancestors or just trying to impress those around us, while misrepresenting/insulting our kūpuna? Do we not know they are observing us and have we totally forgotten that we are accountable for our actions, an understanding our kupuna lived by, and even if we can fool everyone around us, we’ll never fool them? When our time comes, will we be greeted with smiles, and shouts of aloha, or will there be no one there to welcome us? This information is offered with the sole intent to educate and by doing so, we honor our kūpuna and those yet to be born, The Mary Kawena Pūku’i Cultural Preservation Society, extends an offer to share information and provide instructional workshops if desired.